A morning view of Matterhorn Peak. Some of the best times I’ve had with friends are when a group of us hits the road, finds a mountain trail and hikes, backpacks and climbs together. No TV, no cars, no sounds of anything except the babblings of the natural world and the racket that a group of buddies inevitably makes. Apparently I’m not alone. There’s a growing tribe of people who relish in the same thing. They like the same activities – and the same mountains – I happen to like. 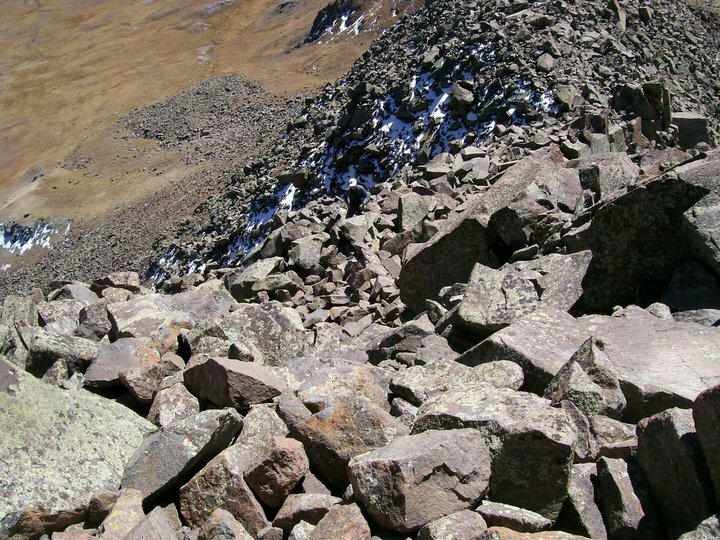 I wrote a story about hiking and climbing Colorado’s 14ers a few years back and talked to a woman who said Longs Peak – one of that state’s more popular mountains – had more than 30,000 people a year climbing it. Near treeline is this ancient dome. Possibly an example of primordial volcanic activity? Given the length of that mountain’s routes and their difficulty, you know there are some who stay away from Longs and head to more accessible, easier peaks. So you might guess that those mountains might receive even more visitors. And therein lies the problem: What happens when you and your buddies are joined by scores of other people just like you and your buddies? Or hundreds? Suddenly that good time outside looks a lot like a day at the city park, but with altitude and people dressed in North Face gear. There’s nothing wrong with that, of course – I’m all for as many people enjoying the outdoors as possible. But if your reason for being outside is to have some solitude (even if it is with friends), then joining the conga lines that form on the trails to a summit can definitely subtract from the experience. Another look at Matterhorn and its eastern slopes. When I look at that, all I can think of is what it would be like to pick a line and ski down that mountain. Unbroken S turns, anyone? You can avoid the holidays, the weekends or whatever, but sometimes you just need to pick a place that gets overlooked. I found such a place, sandwiched between two popular Rocky Mountain destinations. It even has a famous name. The mountain itself lacks the bells and whistles that drive many weekend warriors to the high country. For one, it doesn’t have that magic number in terms of elevation. In Colorado, that’s 14,000 feet. Instead, Matterhorn tops out at 13,590 feet, playing little brother to loftier neighbors Wetterhorn (14,015) and Uncompahgre (14,309). For some, if it doesn’t top 14,000 feet, it doesn’t show up on their radar. Going up the slope. It’s steeper than it looks. In the background is the summit tower. It’s mostly a hike, straight up a somewhat steep, grassy slope until you reach a rocky, jumbled summit tower that goes more vertical. It’s rated Class 3 scrambling, with a variety of ways to reach the top. None are too exposed, and none are very long – maybe a couple hundred feet of climbing and you’re done. This makes the mountain rather undistinguished compared to the sweeping verticality of Wetterhorn or the startling bulk of Uncompahgre. 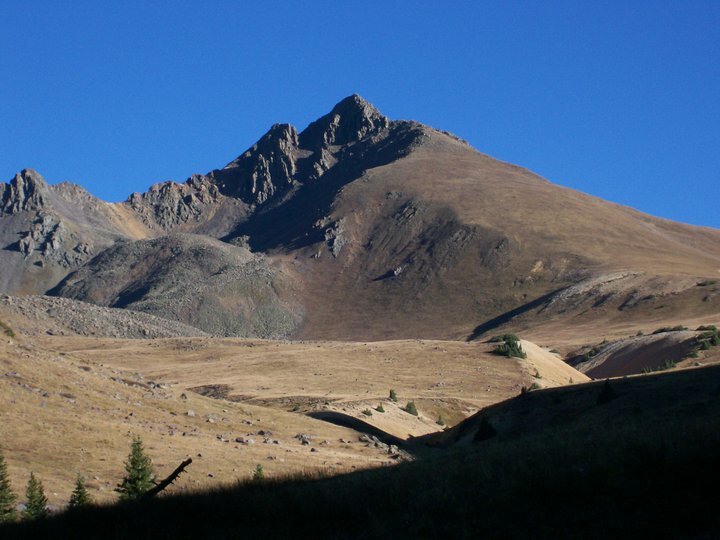 This is not to mention how amazing, difficult and wild much of the rest of the San Juan Range of southwestern Colorado is. But I’ll tell you what Matterhorn is. It’s beautiful. Its jagged west ridge is a stark contrast to its graceful east slopes, culminating in a spiky summit. It blends in with its neighbors like the second in a row of shark’s teeth that look pretty impressive in a panoramic view. And because it’s seldom climbed on its own merits, Matterhorn is a rather lonely place. The summit tower. The easiest route to the top is to pick a line to the climber’s right. It steeper and more fun to just go straight up. If you’ve read this blog much, you know that I often share my outdoors travels with a good friend of mine named Johnny Hunter. 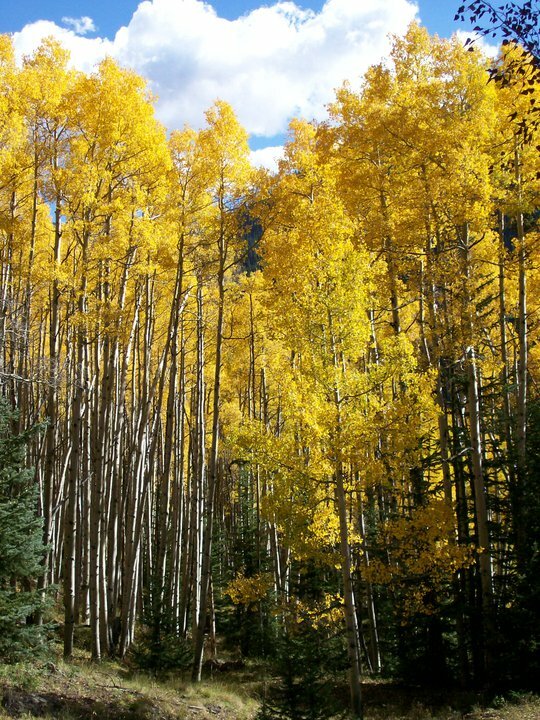 The two of us did this peak together on a mild autumn day at a time when the aspens were turning gold and orange, and the skies were as clear and blue as you could possibly imagine. In the distance, you could see snowpack clinging to the walls of shadowed ridges to the south near American Basin. We had a good time on that mountain. The slog up the slopes was OK, but there was some fun to be had on the summit tower, picking routes, testing handholds and footholds and then relishing one of the best summit views I think I’ve ever seen. 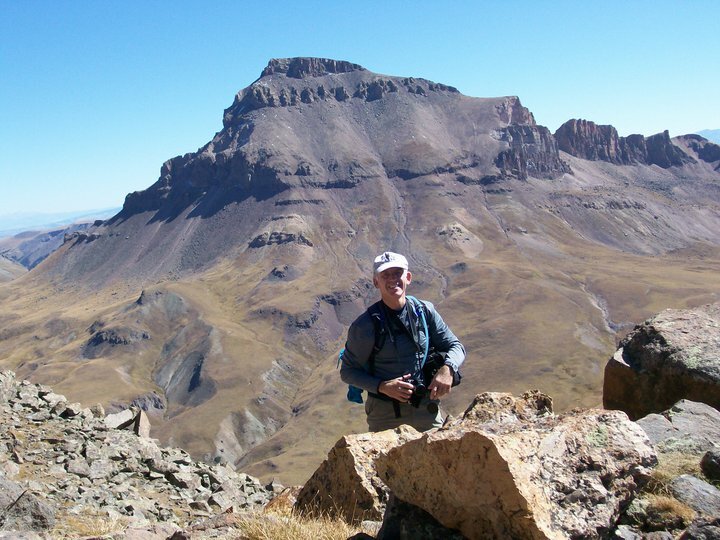 Johnny Hunter at the base of the Matterhorn summit tower with Uncompahgre Peak in the background. I’ve bragged about the views atop Huron Peak on the Sawatch Range, and indeed, they’re awesome. But we’re talking about the San Juans here, and where Matterhorn stands is in a neighborhood with some of the wildest peaks around. I’ve mentioned Uncompahgre and Wetterhorn. But to the north are more amazing mountains, formed by the three powerful geologic forces of uplift, volcanism and glacial carving. Coxcomb and Redcliff peaks loom in the distance, and further away, the sharp profile of Precipice Peak appears. Like Matterhorn, these are rarely climbed, although their allure is strong among trad climbers/alpinists looking for more than a walk-up or a scramble. But what was most remarkable is what Matterhorn lacked that day. Aside from Johnny and I, there was no one on that mountain. We could see, from miles away, the flea-like profiles of people dotting Wetterhorn’s summit. 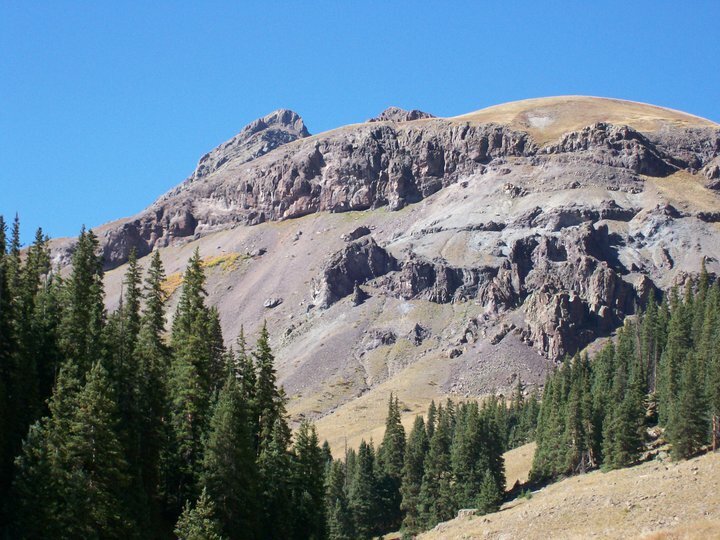 And surely there were hikers on Uncompahgre. But we had Matterhorn to ourselves. Had we decided to just sit and not speak, all we would hear were marmots, pikas, birds and the wind. Looking down a somewhat exposed section on the final pitch. There has only been one other time in my life that I’ve had that much solitude on a mountain (Oklahoma’s Mount Mitchell), and it’s never happened in Colorado, with this one exception. It made me realize that a peak like Matterhorn is worth climbing on its own merits, not just because of the route or its views, but also because it’s one of the rare high country places that is so accessible and yet feels so remote. A look at the rugged connecting ridge between Wetterhorn and Matterhorn as seen from Matterhorn’s summit. GETTING THERE: From Lake City, turn west on Second Street, then a quick left on Henson Creek Road (also marked as the Alpine Loop Scenic Byway). Follow a decent dirt road for another 11 miles (you’ll pass Nellie Creek Road and arrive at the Matterhorn Creek trailhead). From here, a car with good clearance can drive higher up the trail. 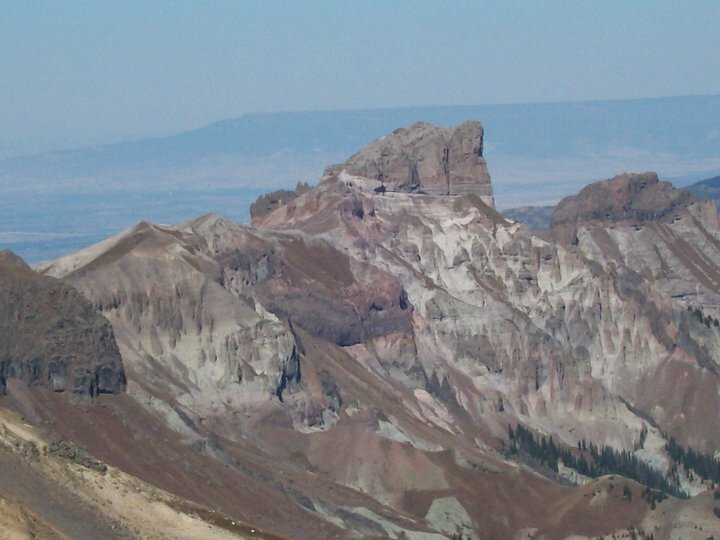 Coxcomb Peak (left) and Redcliff Peak. 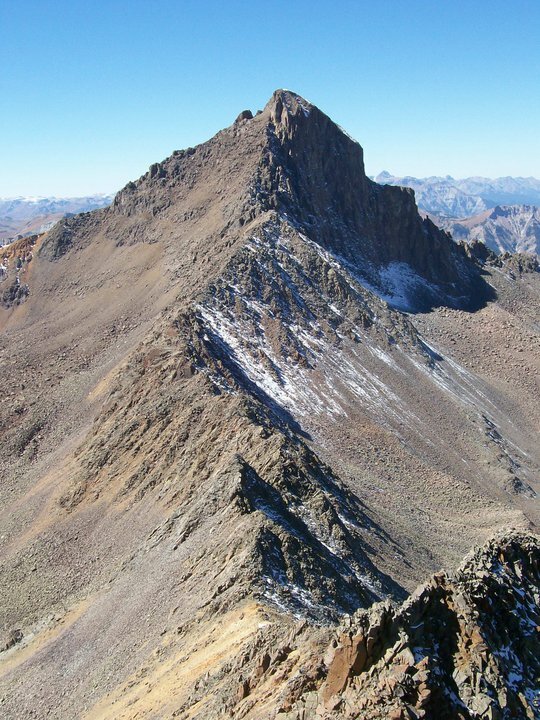 Coxcomb is considered one of the more challenging 13er climbs in Colorado. ABOUT THE ROUTE: From the trailhead, hike north up a well-maintained trail for about a mile until you get to a split in the trail. Going left will take you to the trail leading up Wetterhorn Peak’s slopes. 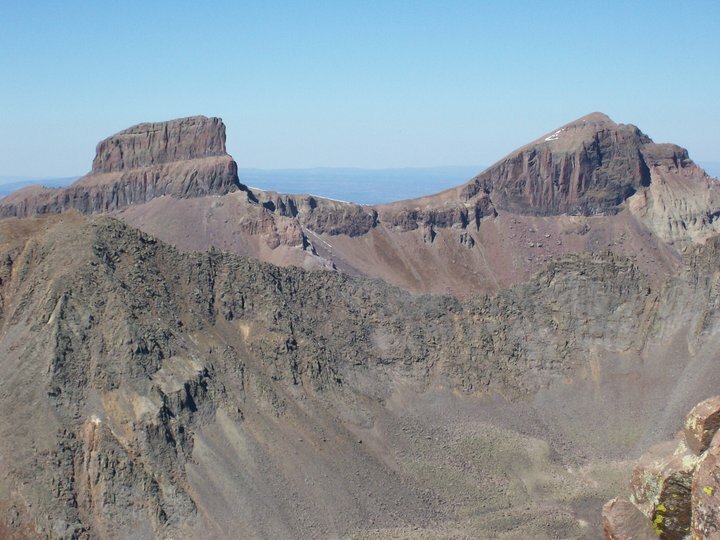 Going right will take you toward Matterhorn Peak and, further east, Uncompahgre Peak. 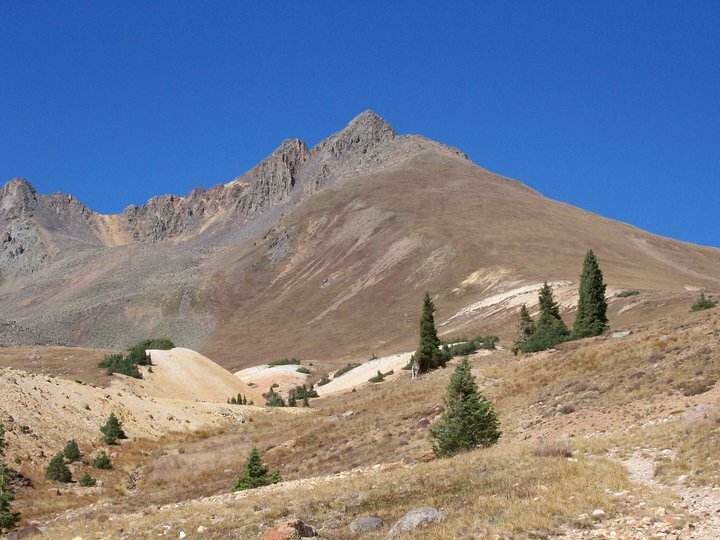 At near 12,000 feet, you will arrive at a junction in which you can continue north or go east toward Uncompahgre. Instead, start hiking west up the grassy slopes of Matterhorn Peak. All the hiking to this point is Class 1. Precipice Peak. Sheer, rugged San Juan goodness. 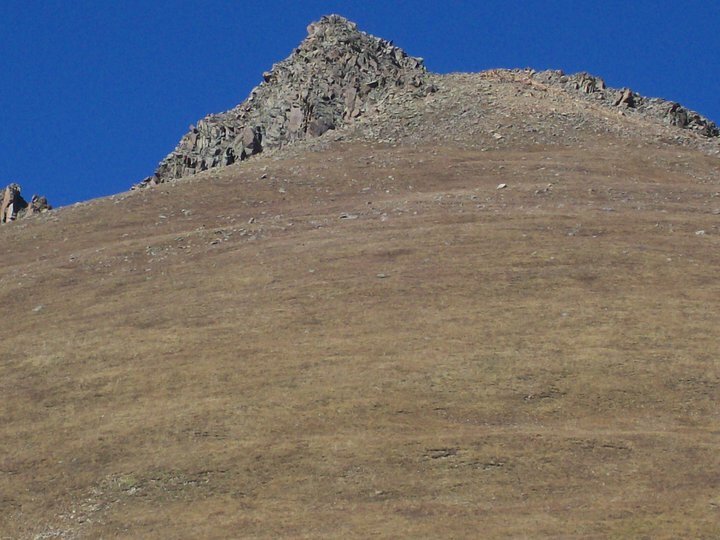 At around 13,300 feet, the grassy slope ends and the rocky summit tower begins. Much of the mountain at this point is a steep jumble of boulders. 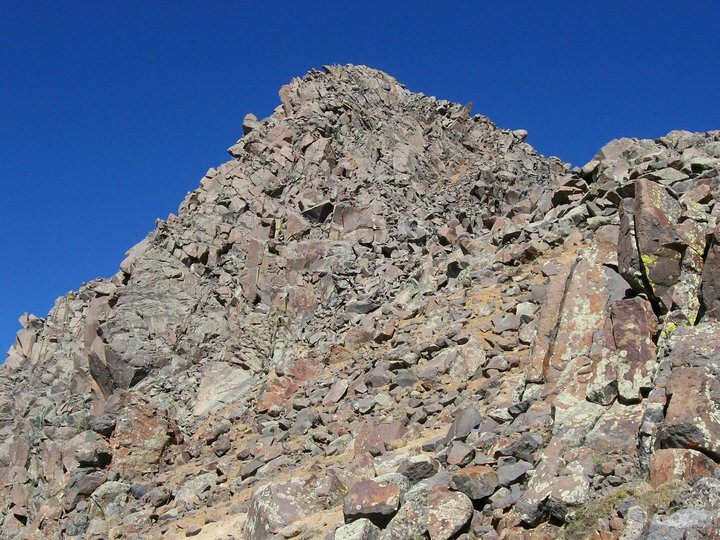 By veering to the climber’s right, you can take an easier Class 3 scramble to the top. Going straight up the tower is slightly more exposed and steeper, but still Class 3. Ascend the remaining 200+ feet to the summit. Be sure to test your handholds and footholds, and know that if you choose a line further to the climber’s left you will encounter higher exposure and looser rock. Aspens turning, cottonball clouds and brilliant blue skies along the Matterhorn Creek Trail. This is the Colorado high country in the fall. This entry was posted in climbing, essays, hiking, mountaineering, outdoors, travel, trip reports and tagged 13ers, 14ers, climbing, Colorado, hiking, Matterhorn Peak, mountaineering, nature, outdoors, Rocky Mountains, Travel. Bookmark the permalink. Knock it off, Bob. You’re making me homesick. The colors that day were out of this world, man. Caught the aspens turning when they were in full fire!